Last Tuesday , 6 July 2010 , the Big V , took on the All Stars team in the annual , EJ Whitten Legends Game . It is a charity fundraiser match, with proceeds going to fight Cancer , which killed EJ Whitten , the former Footscray great . It was a close tussle , with the All Stars running out victors on the night , despite a couple of handy goals from former, Cats great , Sam Newman . A record crowd of 25,347 AFL fans attended the Game , which was held at Etihad Stadium , with the roof closed . It poses the question what team colours , football jumper , jersey, guernsey , did the supporters wear ? 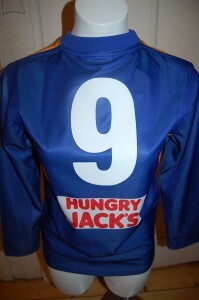 Who wore number 9 Jumper? This entry was posted on Monday, July 12th, 2010 at 10:36 am	and is filed under AFL, football jumpers, NRL. You can follow any responses to this entry through the RSS 2.0 feed. Both comments and pings are currently closed.